One of the fundamental parts of the Magic market is the player base. In order to understand the purchasing decisions of the Magic: The Gathering player, I am going to identify the major and minor forces that influence player participation. The player base size drives the prices of cards, and Magic has seen a significant gain the in the player base over the last few years. 1. Up until 2012, the Magic player base has grown at approximately 25% per year each year for 4 years running (since 2008). 2. It logically follows that due to this player growth, more Magic product is printed each year to keep up with the demand. It is logical to assume that 25% more is released each year to match this projected 25% growth. 3. Thus, since Magic is growing by 25% per year and new cards are printed in 25% greater quantities each year, older cards prior to 2008 printed at the same rarity level (the article emphasizes rare) will be significantly rarer than current cards printed at the same rarity. The author makes several keen comparisons of exactly how rare the older rares are compared to the newer rares. Please read the article to find out more information – it truly is one of the better pieces of Magic finance research I have seen. But what are the forces behind this massive player base increase that drives Wizards to print more and more product? Based on the timeline of set releases, we can see that things are starting to shake up around the year 2008 in terms of product releases. By “shake up,” I mean that Wizards is releasing other sets and product outside of the normal 3 expert-level sets per year and the biennial core set. Outside of the “Un-” sets, the first mass-released casual product was Duel Decks: Elves vs. Goblins. Thereafter, duel decks have been released about twice a year to cater to casual demand. Duel decks are great for newer players because they expand collections much better than intro decks. Wizards can reprint cards that are too powerful for Standard that are still casual favorites (Counterspell in Jace vs. Chandra is a good example). The decks also include occasionally hard-to-find player favorites (Elephant Guide, Armadillo Cloak) that players love for casual 60s. If purchased for $20 they are a great deal. Around the same time, Wizards also started to release From the Vault (FTV) sets. The first FTV was released nine months after DD: Elves vs. Goblins. It was FTV: Dragons, which in retrospect was a great choice for casual players but left other types of players (those spikes wishing to pimp out their tournament decks) somewhat dissatisfied. In order to accommodate spikes, other FTVs have been released that cater more to them – FTV: Exiled and FTV: Relics were aimed at spikes in addition to the newly released FTV: 20, which included Jace, the Mind Sculptor. The theory I believe influences this change in FTVs is that casual players prefer not to play with foils – therefore, a foil based product should be aimed towards more serious players and collectors (I think this is why FTV: Legends was also less popular than previous FTV products). The FTV sets add another dimension to the game that allows players to (somewhat) easily obtain copies of cards that would otherwise be hard to find in foil. Planechase, Archenemy, and Commander continue to add further dimensions to casual play. Again, these formats allow older, more powerful cards to be reprinted (Sundering Titan, Thran Dynamo, etc.) and at the same time create new ways to play Magic. Also, like duel decks and FTV products, they were released after 2008 – the key year identified as the start of the player base explosion. One failed experiment was the Premium Deck Series. I attribute this to the foiling of the cards – like I mentioned before, I have a theory that casual players prefer not to play with foil versions of cards, and because of this the decks weren’t as popular as they could have been. Once Wizards was aware of this, they adjusted their strategy accordingly. As traders and speculators, we should also keep this in mind – when trading or selling to casual players, the nonfoil cards are just fine most of the time. Finally, the rebranding of core sets (naming them after years, e.g. 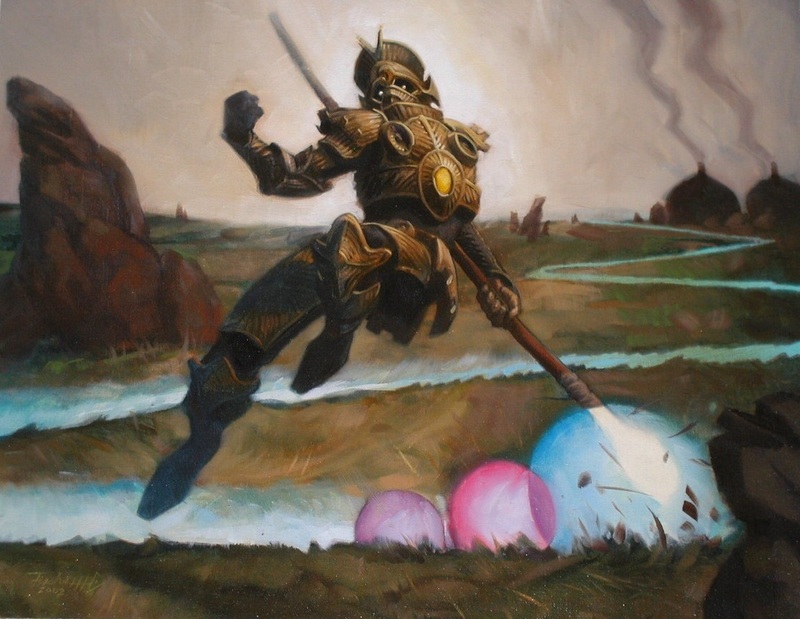 Magic 2013) and introduction of brand new cards has further enabled Wizards to keep the game fresh and exciting for both new and returning players. Given these examples, I think it is pretty clear that appealing to the casual crowd has enabled the game to be more successful than ever. Another reason Magic has been so successful is because Wizards is good at recognizing the general player mood and responding to it in a positive way. They receive feedback from customers and vendors alike, and are more apt to change course when a group of players feels left out. Wizards also knows that change is necessary. Even if negative feedback is received about a new idea, they will take it in stride and work towards improving the game. Wizards even tries to ameliorate bad medicine like mythic rares by reprinting popular ones in commander or duel deck products. Modern Masters is a perfect example of Wizards becoming more flexible. Even though Chronicles was a disaster, Wizards was able to correct their mistakes with Chronicles and create a successful product the next time around. Though I say social media is a “minor” force in the success of Magic, I would not underestimate its impact. I truly believe that Twitter is part of the success of Magic. It allows players to connect in ways that were not possible before. In addition, Reddit has also greatly expanded the scope of Magic – currently, there are approximately 80,000 users subscribed to http://www.reddit.com/r/magictcg. Amazingly enough, that’s only about 2% of the estimated Magic population. There is still plenty of room for growth in this area and I am sure that Wizards knows this better than anyone else. Get the power of the Internet behind you and anything is possible. There are definitely other factors that have made Magic successful, and I would love to revisit this topic at some point in the future. I think it is fascinating to consider the forces that influence players and their buying decisions. Knowing these factors plays a huge role in understanding the Magic finance market and knowing what cards and formats are best to trade/buy into in anticipation of future gains. Chime in below in the comments about any factors that have made you want play Magic in recent years.